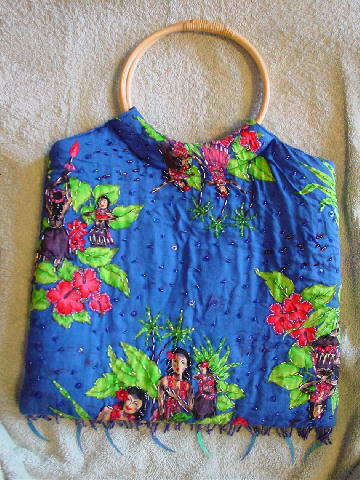 This never-used 100% rayon handbag was designed in Hawaii and made in Indonesia. It has a shiny dark blue lining, zippered interior pocket, and a magnetic snap interior top closure. There are two circular handles (feels like a coated wood) and a wrapped area on one area (the handles spin freely). The exterior dark blue fabric has some padding behind it. 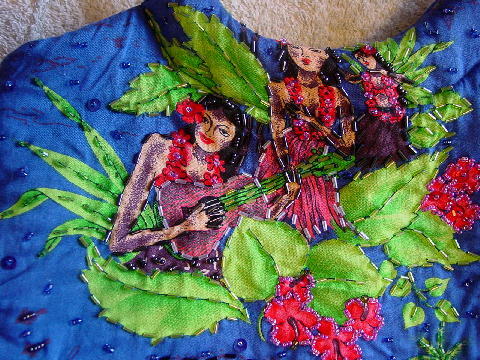 There are hula dancers, Hawaiian girls playing an instrument and carrying a jug, palm trees, leaves, and flowers in curry, sand, dark brown, purple, black, offwhite, and red. It has accent elongated and round beads in light cherry, black, iridescent light green, titanium, and blue. 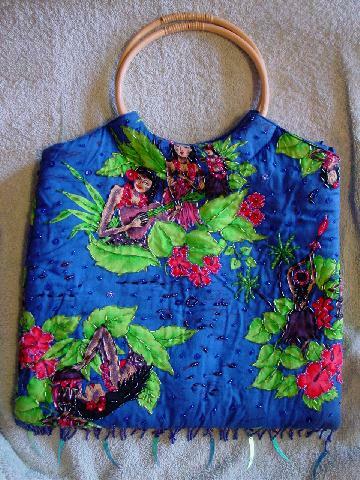 There are also sequins in blue and cherry. At the bottom are strands of 15 little beads in cherry, blue, titanium, and there are eight curved 1 1/2" long iridescent accents dangling from the bottom of some of the strands. It has some brown accent lines on the surface. It can be worn in the evening as well as the daytime. 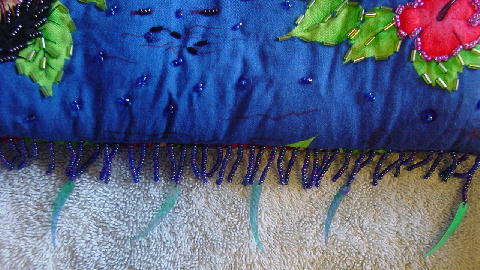 There are a few green beads missing on the back side on one of the palm tree fronds. A model got it as a present while on a location photo shoot.